Hatteras Yachts has a well-known legacy of building fiberglass yachts. The greatest testament to the company’s prolific construction is probably the large number of its boats still plying the fishing and cruising grounds of the world, but Hatteras probably gained its greatest share of fame from its distinctive convertibles that launched the Carolina legend. 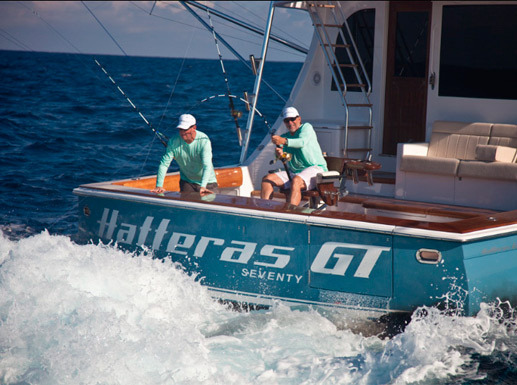 The latest fleet of the company’s sportfishing models includes a 77-footer and four models in the hard-charging GT series ranging from 54 feet to the newest and largest of the lot—the Hatteras GT70. The GT70 is stable at cruise and very comfortable on the bridge and below. Where the builder has found areas to improve upon it has done just that, but the basic elements that have made the GT series well received by offshore fisherman have not changed such as the noticeable bow flare and the eye-catching tumble home transom. “The tournament fisherman loves the exterior styling, the speed, the clean cockpit with great stowage, and our clean engine room where thoughtful professionals took the time to do it right,” Donahue says. Hatteras will never be accused of underbuilding a yacht and the GT70 is certainly no exception. 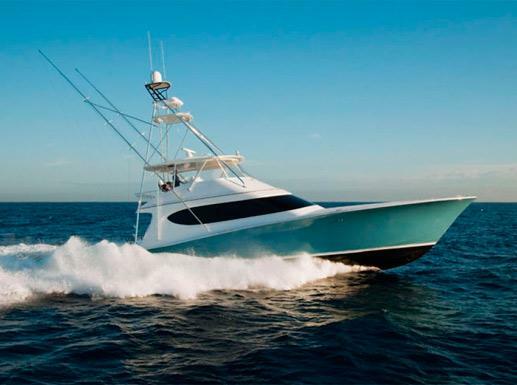 Combine solid construction and power and you get a ride that’s strictly Hatteras.